$ 226.3 billion (purchasin pouer parity) (2006). $5,339 (purchasin pouer parity) (2006). 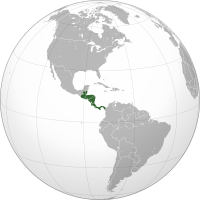 Central Americae (Spaingie: América Central or Centroamérica) is the central geografic region o the Americas. It is the soothrenmaist, isthmian portion o the Central American continent, which connects wi Sooth Americae on the sootheast. When considered pairt o the unified continental model, it is considered a subcontinent. Central Americae consists o seven kintras: Belize, Costa Rica, El Salvador, Guatemala, Honduras, Nicaragua, an Panama. Central Americae is pairt o the Mesoamerican biodiversity hetspot, which extends frae northren Guatemala through central Panama. It is bordered bi Mexico tae the north, the Caribbean Sea tae the east, the North Paceefic Ocean tae the wast, an Colombie tae the sooth-east. Central Americae is an aurie o 524,000 square kilometers (202,000 sq mi), or almaist 0.1% o the Yird's surface. As o 2009, its population wis estimatit at 41,739,000. It haes a density o 77 fowk per square kilometer. This page wis last eeditit on 17 Mey 2018, at 06:26.